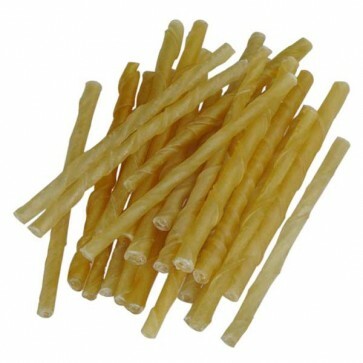 Rawhide Twists are made from high quality rawhide, they are high in protein and low in fat with NO added preservatives or artificial colourings. Our Good Boy Chomp Stix we sell are also known as ''Rawhide Twist Sticks' or simply 'Rawhide Twists' to many customers are available from us in a variety of sizes. They are made from 100% natural beef rawhide that's tightly rolled, then twisted to create the traditional long lasting, chew stick your dog loves with a distinctive spiral curve that owners have giving to their dogs for years. The rough edges of the rawhide twists and good boy chomp stix will help keep your dog's teeth and gums healthy by scraping away plaque and reduce tartar build up by flossing in between your dog's teeth and gums. 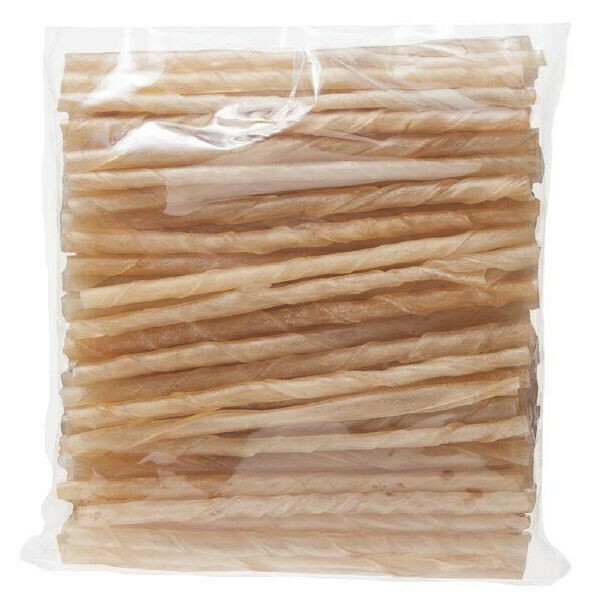 Many popular dog treats use rawhide twist sticks like a kebab skewer to wrap around chicken, duck or beef to create a delicious meaty treat that's chewy and low in fat. Chewing on rawhide that's hard and abrasive should also help with bad breath as food deposits are removed around the teeth when your dog chews them and should also help reduce the risk of dental problems. Rawhide twists stimulate harmless fun by providing your dog with a natural outlet for boredom and stress relief, entertaining your dog(s) for hours which is especially important for older dogs who may not be as active. 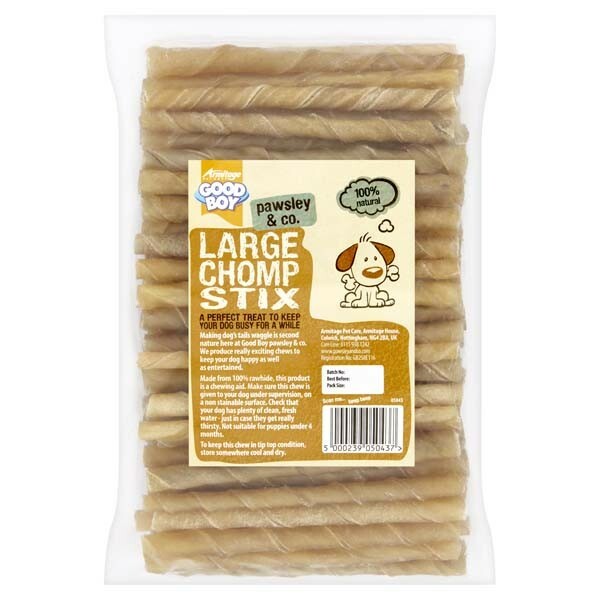 The Good Boy Large Chomp Stix we stock will help satisfy your dog's instinctive urge to chew something, which should help owners avoid destructive chewing behaviour by puppies or adult dogs around your home, that can be very costly from personal experience. Rawhide Treats like twists, cigars, sticks and bones can also help relieve a puppies teething pain, by stimulating the growth of adult teeth through harmless chewing. If your dog easily destroys toys we would suggest you only purchase compressed chews that are made from layers of rawhide that are longer lasting and ideal for dogs that are aggressive chewers for example Rawhide Cigars. 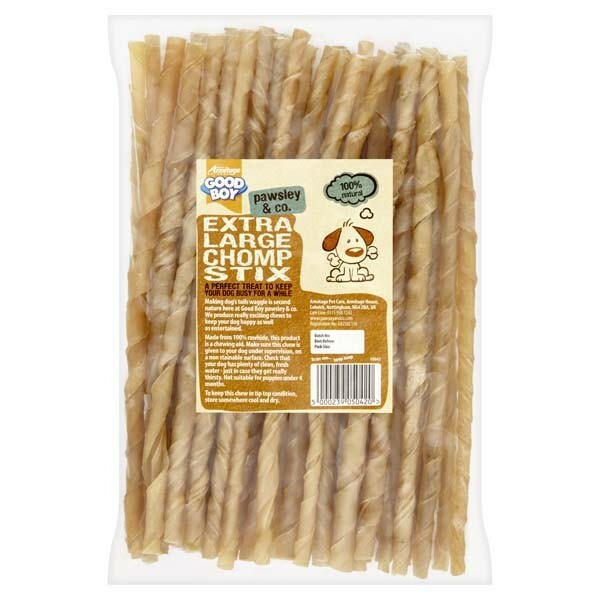 Please note the large rawhide twists we sell are approximately 9 - 10mm thick, they are NOT the standard thin small and medium twists sold by many online sellers and pound shops that are flimsy and easily destroyed! The store rang us after we ordered to let us know they were waiting for more stock to come in and there would be a delay. The Chews arrived a few days later and again the Store rang to let us know they had been despached.